“I thank God for the time that he gave us together, good and bad,” Jan Gaye writes at the conclusion of her recent memoir, After the Dance: My Life with Marvin Gaye, “for without both I would’ve had none.” Even thirty-one years after the tragic death of the music legend that was her husband and father of her two children, such an acknowledgement could not have been easy to come by. The eleven-year relationship she recounts here in stark and often forthright detail is fraught — despite its many gentle, loving, and passionate moments — with simmering distrust, betrayal, and, on occasion, violence. Still, hindsight has afforded the author a balanced, empathetic perspective with which to tell her story. Already smitten with the suave, sophisticated image she’d seen on Soul Train and on various album and magazine covers of the day, seventeen-year-old Janis Hunter’s celebrity crush on thirty-four-year-old Marvin Gaye developed into an all-too-human hunger thanks to a fortuitous meeting with the Motown superstar at his Los Angeles recording studio during a session for his landmark 1973 album, Let’s Get It On. The attraction between the two was immediate though furtive at first and while a courtship ensued, odds of them enjoying anything beyond a fleeting affair seemed anything but promising. Particularly encumbered was Gaye, who was then embroiled in a bitter divorce from his first wife, Anna Gordy (older sister of Berry, president of Motown Records), as well as myriad financial plights and professional anxieties. Regardless, Hunter and Gaye’s mutual passion would not be denied. Such baggage couldn’t help but intrude on their relationship (and, come 1977, marriage), though as underscored throughout the book, the couple’s greatest burden — indeed, the prime catalyst for whatever chaos they wrought and suffered both individually and together — was substance abuse. The author is unflinchingly explicit at times in her recollections, in particular when depicting her husband’s gradual descent over the last few years his life amid the throes of hard drugs and their destructive, psychotic effects. Such moments come across not as an indictment on Marvin Gaye’s character or his legacy, however, but rather as unvarnished examples of the way things were at the time. If anything, the author places just as much scrutiny on her own past behavior, conceding amongst other indiscretions how her own substance abuse affected her marriage and life in general, so much so that not even Gaye’s death at the hand of his father in 1984 could at once compel her to seek help in an effort to quit. 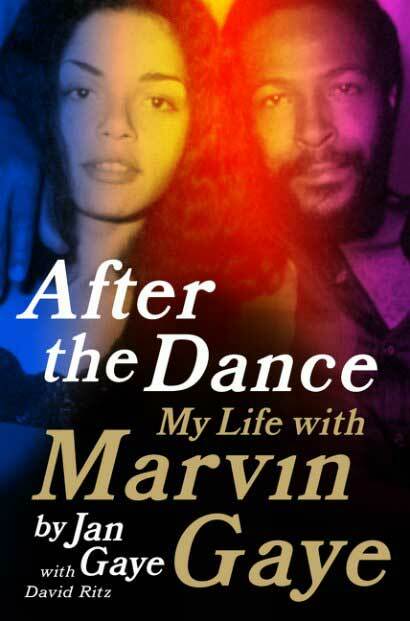 While not a biography of Marvin Gaye — the definitive one being Divided Soul by David Ritz, who serves as co-author here — After the Dance nevertheless includes truly fascinating insights to his creativity and talent, the sort which are revealed in the most inconspicuous moments or in drowsy, late-night conversations in bed. In other words, the sort which only an intimate confidant could know. In a broader but no less personal context, the same could be said for this overall gripping memoir as a whole.